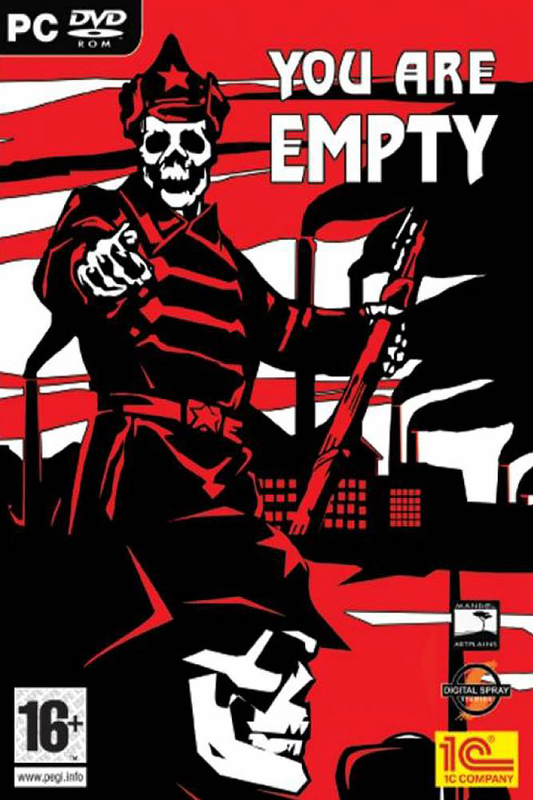 You Are Empty, created by defunct Ukrainian developer Digital Spray, is not a good video game. The graphics are out of date, relying on shopworn polygons and flat textures more common to games from the beginning of the decade rather than anything on the shelves today. The gameplay sticks solidly to the tenets of first-person shooterdom, with nothing in the way of innovative new mechanics. From the outset, the player is intended to play the game running on a narrow track, with most attempts at exploration resulting in punishment. The player moves through the world at a crawl and can easily be trapped by the scenery. The enemies do little more than charge mindlessly and most of them are more ridiculous than terrifying. So little is revealed about the game’s storyline that it almost appears as though the story were simply dropped during the game’s translation into English. Finally, the area around the player appears to have been curiously foreshortened, making basic melee and grenade attacks a hit-and-miss proposition. So, why talk about You Are Empty? Why talk about a fly-under-the-radar game that was panned by every North American reviewer when it was released back in 2007? In a word: atmosphere. You Are Empty is set in an unnamed Soviet megapolis sometime in the early 1950s, during the final years of Stalin’s reign. The player assumes the role of an unnamed militiaman, one of the city’s faceless thousands, whose average day is brought to a halt by a traffic accident. Regaining consciousness some weeks later in a wrecked and abandoned sanitarium, and haunted by dreams of a massive tower topped by a great red star, the player must escape the sanitarium, journey to the dead city and discover the cause of the disaster. While the plot is bog-standard, the game makes exemplary use of its setting. The levels are a whistle-stop tour of midcentury Soviet life, moving from collective farm to factory to workers’ tenements to the metropolis itself, with its great bridges, monuments, cinemas, theaters and subway. The game blends high Stalinism and the apocalypse perfectly, with every locale adorned with mass-produced posters, faded banners, severed power lines, broken trucks and trams and scratchy radios burbling out endlessly repeated warning bulletins. The enemies themselves are given a similarly Soviet bent, with the player being beset by over-muscled welders, scarecrow kolkhoz workers, insectoid electricians and half-dead soldiers in Civil War-era uniforms. The weapons available to the player continue this theme, mixing World War II-era weapons (Mosin-Nagant rifle, Shpagin machine pistol, Molotov cocktails) and scavenged factory equipment (pipe wrench, nail gun and a sort of electricity thrower). However, the real horror in the game comes not from the fighting but from the environment. For much of the game, the player will be wandering through an urban core designed as monument of Stalinist Gothic. Every street and plaza is surrounded by great pseudo-classical buildings, bloated with concrete, that glare down at the street from every direction. It is a type of architecture common in the great urban spaces of Russia and it has the effect of making the pedestrian either aspire to godhood or feel crushed into insignificance. It is an effect that You Are Empty captures perfectly. The haunted ambience is further enhanced by the game’s sound, which balances between a smooth techno-industrial soundtrack, the grunts, masked snuffles and nasal Slavic moans of the transformed populace, and the dead silence of a mausoleum city, where there is no one left but you. Just to keep the tension ratcheted, the game occasionally provides cutscenes animated in a stark, Expressionist style that fits perfectly with this world of shadowy cruel figures and overbearing machinery. While the mystery is never quite unraveled, the game makes some attempts at explaining itself. Veterans of BioShock will probably find the outcome of You Are Empty familiar, as both games draw on ideas and theories of the biological perfectibility of man that were common in both the Soviet Union and the West in the early twentieth century. Overall, with the game now at clearance-sale prices, You Are Empty is worth an evening or two of monster-blasting and Soviet sightseeing. Despite the many design flaws, it can still conjure unsettling visions of a world that never was. Oh, and after playing this game, you will never look at firefighters the same way again. This story first appeared in Gatehouse Gazette #8 (September 2009), p. 11-12, with the headline “The New Soviet Monster; You Are Empty”.